This update was dedicated to tracker’s interface improvement and small but important for many clients functions as Cap, multicurrency, root domain tracking, enhanced API allowing to manage all tracker’s content including traffic distribution in campaigns. We updated LP Pixel, currently it works solidly in all browsers and devices. We created intra-daily trends by hours (while they are quite limited, we are going to improve this function in the next update up to trends by all tracker’s metrics). Also, tracker security was enhanced with protection against brute force and two-factor authorization. But first things first. Time zone set up is also available. Apart from interface enhancing the main novelty is possibility to track domain index page through special campaigns attaching. It can be useful for detection of moderators and bots traces (real traffic very seldom positions to root domain). Through this campaign you can use as index page any html with help of integrated landing. I.e. in actual words it’s possible to build a mini-site where on pages as tracker.com/index.php?page=N will be Money Page or stubs for moderation while on index page will be “white content” + tracking opportunities. We also added opportunities of domains mass adding and domain selection for meta-refresh in campaign’s settings. We’ve already implemented possibility of mass domain changes in campaigns and check of ban in Google. We had a question of where to put secondary functions without interface overloading. 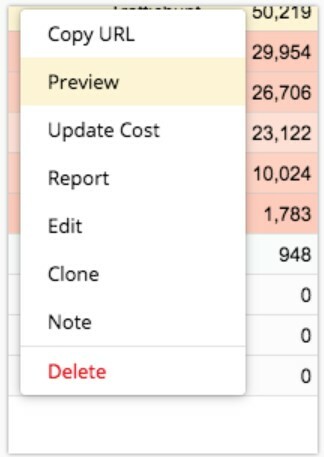 So, we decided to create context menu in all reports. For example, for the Campaigns page it looks like this. It allowed us to add different mini-functions such as campaign pre-view, cost update from campaign’s page. In report this is Drilldown, editing and landings and offers pre-view form report, etc. Also, we added ability to change campaign without necessity to open Campaigns page. Plus, we a little bit overworked filters and export, enhanced calendar and added timeframes “last 2 days” and “last 3 days”, added report by users. We created Pixel “protecting” algorithm for browsers that block cookies. Safari mobile, Facebook browser and other small ones, now it’s working as it should be and you can add easily without tracking redirects where you want. Now through API you can manage whole tracker, campaigns, users, offers, landings, rotations, traffic distribution, and even mark publishers. Detailed documentation is being developing, but following this link you can find all methods and usage examples. Also, you can contact support for consultation. Protection against brute force and two-factor authorization through Google authorization. After five failure attempts to enter tracker it is blocked tightly, and can be restored only with Support assistance. But at that time, we created function of password restoring through the Google Authenticator app. If you want to know how to use it, read documentation. Perhaps someone didn’t notice this small update, which is the best update of this year in my opinion. I mean the “Trends” by the hour (it’s only for today and yesterday for now) for all the campaigns. I used to request stats through the “Campaigns” column to see how’s everything going (bad or better). It took much time to request 30-40+ campaigns at the same time. So for now you can just go to the “Trends”, choose “Today” and see the stats by hour instead of days.